The breeders at Royal Queen Seeds wanted to create a Kush that was both unique and exquisite. Using a careful selective breeding process to hybridise the best Banana OG specimens, they achieved this goal with the sensational Fat Banana. A cross between OG Kush and Chiquita Banana, this lady sure is a Kush like no other. Get ready for a truly "Fat" cultivar that is packed with fruity flavour and enormous potency! Fat Banana is a hybrid (70% indica/30% sativa) that displays some unusual traits during her growth. Unlike most indica hybrids, she will develop one massive main cola that, with the right nutrients and in good conditions, can reach a monstrous height. Indoors, she may stay at a manageable 80–140cm, but outdoors, she can grow into a massive tree up to 200cm. As such, she may look to you for support. Fat Banana produces decent yields up to 400g/m² of some fat and juicy goodness indoors, and up to 500g/plant in ideal outdoor conditions. Her pleasantly short flowering time of only 7–8 weeks can surely be attributed to her indica side. No doubt, flavour and aroma are among Fat Banana’s most superb qualities. She will tickle your taste buds with an awesomely sweet and fruity Banana aroma. Just like a tropical fruit basket, her mouthwatering and refreshing notes will delight the senses and keep you coming back for more. Keep in mind, this delicacy can be a real heavy-hitter, so tread lightly when lighting up. Upon toking this strain, an incredibly deep and relaxing physical stone will take over your body. When you spend some quality time with her, you shouldn't just get ready to hit the couch, we also recommend you stock up your fridge because all that flavour will cause the munchies big time! 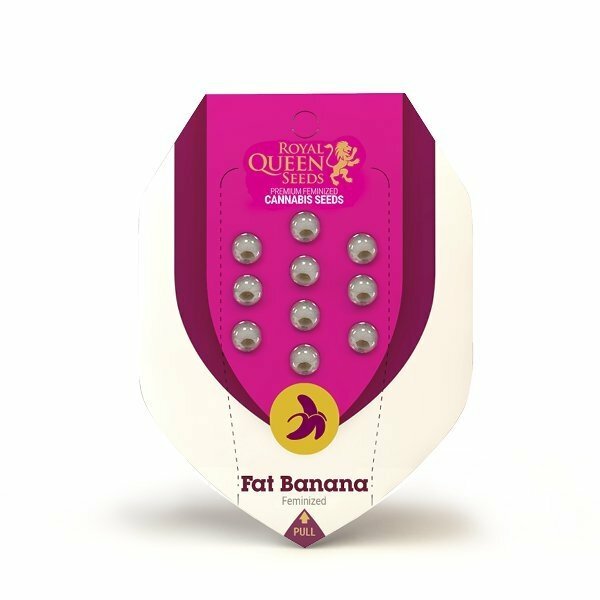 Royal Queen Seeds’ Fat Banana is a truly exceptional Kush that stands out from many others. The fruity flavour and sheer potency of this strain alone make her worth growing!